Have trouble reading your prescriptions? Are prescriptions instructions difficult to remember? Do you want independence from having your friends or family read your prescription instructions to you? ScripTalk provides a safe, convenient way for you to be able to manage your prescriptions on your own. The ScripTalk Station provides freedom to those who cannot read or have difficulty remembering the information on their prescriptions. It is safe and simple and allows independence. Press the read button and hold the special Talking Label over the reader. An audible and clear voice speaks all the information printed on the label. The ScripTalk Station uses RFID and text-to-speech technology. There is a thin antennae and microchip embedded within the label that is placed on the bottom of each pill bottle. They are then are programmed with all the printed prescription information. 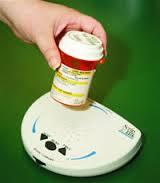 The circular label is used on any size bottle, box, vial, tube or other prescription container. 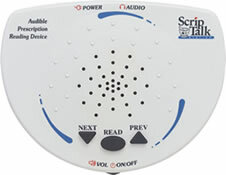 The ScripTalk Station is the only audible prescription reading device to meet all federal requirements listed under the Federal Drug and Cosmetic Act (FDCA), Americans with Disabilities Act (ADA) and Health Information Portability and Accountability Act (HIPAA).